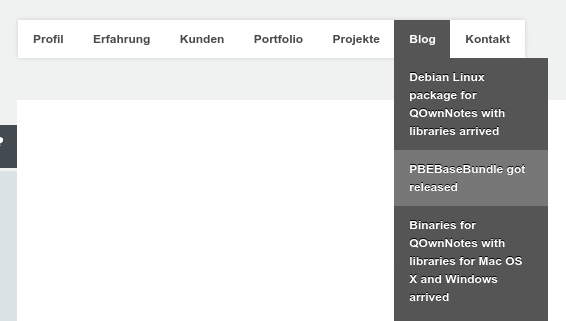 The PBE Base Bundle is an open source (GPL) webpage helper bundle for the eZ Publish 5 Platform. Two level top menu generation from a folder with folders and links to be included in the pagelayout. pbe_fetch_content twig function to load content in twig templates. This could, for example, be used in the pagelayout to load content from an object relation list. Added active menu item support and support for injecting other sub-locations to directly link to. First you'll need composer, if you don't already have it. You can execute this in your eZ Publish root directory. To override code of the PBEBaseBundle you can also make it parent of your bundle. Take a look at How to Use Bundle Inheritance to Override Parts of a Bundle for more information. Just include this code into your pagelayout.html.twig where you want to put your main menu. In this example 86 is the location id of the parent folder. You can also add sub-locations that are directly linked to in your menu. For example for your menu entry with the location id 101 additionally load a maximum of 8 items of location locationId. The "Blog" menu entry has the locationId 101. The blog posts are directly loaded from the blog ('locationId': 70). You can use this twig function in your templates to load content. In this example 57 is the content id. It will return a \eZ\Publish\Core\Repository\Values\Content\Content object.